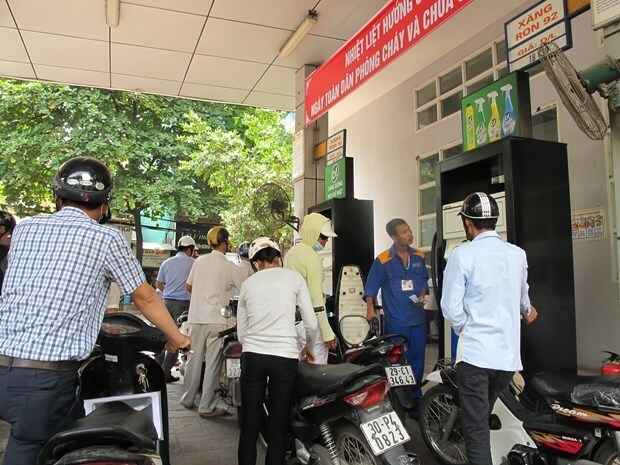 Hanoi (VNA) – The retail prices of oil and petrol rose sharply from 3 pm on April 17 following adjustments made by the ministries of finance and industry and trade. The two ministries review fuel prices every 15 days to adjust domestic prices in accordance with swings in the global market. Accordingly, the retail price of bio-fuel E5 RON 92 has been raised to a maximum level of 19,703 VND (0.85 USD) per litre, up 1,115 VND (0.048 USD) per litre; while that of RON95-III was raised to the ceiling price of 21,235 VND (0.92 USD), rising 1,202 VND (0.052 USD) per litre. Meanwhile, the ceiling prices of diesel 0.05S and kerosene edged up 297 VND (0.0127 USD) and 291 VND (0.0125 USD) per litre to 17,384 VND (0.75 USD) and 16,262 VND (0.7 USD) per litre, respectively. Mazut 180CST 3.5S will be be sold at no more than 15,617 VND (0.67 USD), up 407 VND (0.017 USD) per kg. This is the second time since the Tet holiday that petrol prices have been strongly altered after the price stabilisation fund had to be used several times to keep prices steady.